Heat oven to 350°F. Grease bottom and sides of three 8-inch square pans or three 8-inch round cake pans with shortening; lightly flour. Mix flour, baking soda, baking powder, cinnamon, 1/2 teaspoon salt and the allspice; set aside. In large bowl, beat granulated sugar, mayonnaise and eggs with electric mixer on medium speed, scraping bowl occasionally, until blended. Beat in 1 tablespoon brandy. Gradually beat in flour mixture until batter is smooth. 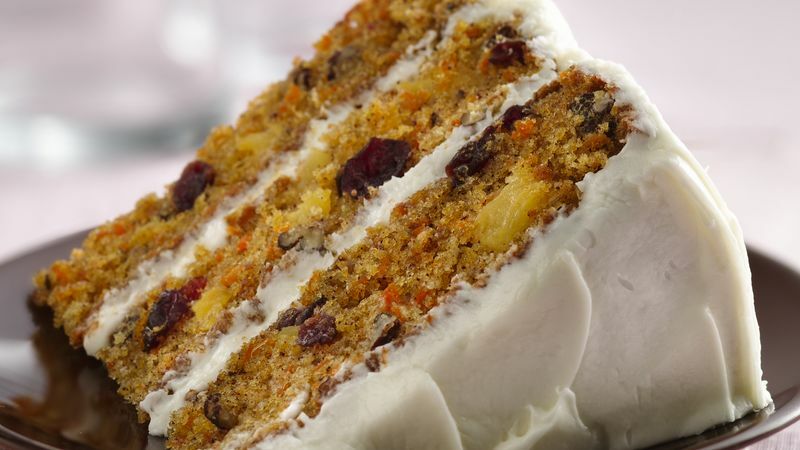 Stir in carrots, pineapple, pecans and dried cranberries. Pour into pans. Bake 30 to 35 minutes or until toothpick inserted in center comes out clean. Cool 10 minutes; remove from pans to wire rack. Cool completely, about 1 hour. In medium bowl, beat cream cheese, butter, 1/2 teaspoon brandy and 1/8 teaspoon salt on medium speed until smooth. Gradually beat in powdered sugar on low speed until smooth and spreadable. Fill layers and frost side and top of cake with frosting. Garnish with cranberries and orange peel. Store covered in refrigerator. Regular brandy can be used for the ginger-flavored brandy in the cake and frosting; add 1/8 teaspoon ground ginger with the cake's dry ingredients. If you have only two pans, spread one-third of the batter in each of two prepared pans. Cover and refrigerate remaining batter while first two layers bake. After removing cakes from pans, cool one pan before baking remaining batter. Third layer may need to bake 1 to 2 minutes longer.